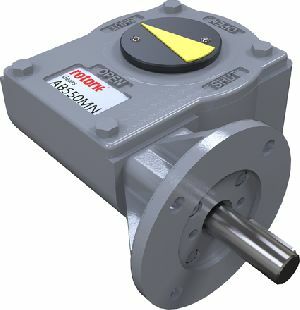 The latest addition to the market-leading range of gearboxes manufactured by Rotork Gears is a rugged, industrial grade product designed for use with motorised quarter-turn valves and dampers. The new AB550M gearbox is manufactured as standard with cast iron housing components, high performance axial thrust bearings, a protected steel input shaft and a polyurethane coating to deal with arduous applications and aggressive environments. The ability to support electric actuators weighing up to 46 kilograms and input speeds of up to 96 rpm offers suitability for many applications in the chemical, power generation, water & sewage treatment, HVAC and general industries. With a maximum output torque of 600 Nm, 45mm maximum output bore, output flange sizes from F07 to F16 and +/-5º adjustable 90º stroke, the AB550M will operate a large range of ball, butterfly and plug valves, or power and process dampers. The ambient operating temperature range can extend from -60ºC to +200ºC, whilst the standard IP67 environmental protection can be increased to IP68 for marine, continuous submersion and buried service duties. A firesafe option conforming to ISO10497 is also available. Find out more about the AB550M gearbox.